When Booboo was almost 18mo she started attending a home-based daycare a couple of days per week. I am a stay at home mom but I still choose to send my kids to daycare at least part time. I know that this is not always the popular choice but I find it necessary for my own sanity. When I was dealing with PPD, one of the most helpful things I could do was get some regular kid-free time that I could depend on and look forward to. Lulu, who is in preschool now, attended daycares when I was working and after I became a SAHM and this worked well for us. In sending Booboo to daycare I discovered that not only was it helpful for me and my mental health but that it was also great for our family overall. Booboo has a blast at her daycare and the sisters having some time apart gives them a chance to miss each other. It was an unexpected side effect that sending my toddler to daycare helps with sibling rivalry. It’s a controversial topic to be sure. A quick google search for “stay at home mom sending toddler to daycare” produces a barrage of angry, judgemental articles, blog posts and questions from both sides of the camp. Why would a stay at home mom send her toddler to daycare, even part time? Doesn’t she love her child? Doesn’t she know no one can take care of her kid like she can? Doesn’t she want to spend every second of every single day with her precious explorer? Doesn’t she CARE? From the other end of the spectrum comes the pseudo-science of how daycare and socialization is great for kids and how you’re depriving your child of important learning opportunities by keeping them at home. Everything from walking, talking, eating and behaviour are supposedly better in children who go to daycare. It doesn’t seem to be necessarily accurate, but that doesn’t stop articles and “studies” from being published saying it. As for me, I am a fan of daycare. I prefer small home daycares for my kids and there are definitely pros and cons to sending them to any kind of childcare. But even as a stay at home mom I still send my kids to daycare part time, a couple days per week. It isn’t because I think daycare is better for kids’ development. I also don’t think daycare makes attachment and connection with the parent any weaker. Being a stay at home mom is tough, no matter how you choose to do it. I applaud the stay at home moms who homeschool and those who use childcare facilities. Daycare is just one tool. A helpful (and expensive) resource. Using or not using a daycare doesn’t make you a bad mom. Doesn’t make you a lazy mom or a martyr mom. We all gotta do what’s best for ourselves, our children and our families. What works for one mom will not work for another and that’s perfectly alright. In the case for our family sending my toddler to daycare is the best decision for us. Booboo, now 20mo, has a blast in daycare. It’s play-based and home-based. Since we’re in California the kids spend most of the day every day outside in the huge back yard. There are a bunch of trees in the yard. A great sandbox, a playhouse and a couple of slides. She spends the days she’s there exploring and getting dirty. I pick her up looking grimy, a little bit scraped up and very very happy. Some days when I come to pick her up I catch a glimpse of her playing before she notices me and I see her in her element. Exploring busily, her face focused on moving dirt or collecting sticks or tinkering in the little kitchen of the playhouse. She misses us, of course. But she walks in happy and relaxed when I drop her off and I get the thrill of seeing her face light up when I come to pick her up. My preschooler, Lulu, is 4.5 years old. She’s in a part-time preschool program for a few hours four days per week. The two days that Booboo is in daycare are split between having a couple hours to myself while both kids are in their programs, and spending a few hours with Lulu. We get to spend some precious one on one time together. I do try to use these days to do some housework and run some errands. Even Costco trips with just one kid or prepping dinner while she’s colouring and chatting at the kitchen table feel different. Calmer. Freer somehow. A glimpse into how things used to be and how they might have been if her sister hadn’t been born. I get to see my preschooler in a different way when the toddler isn’t there. When they are together, they spur each other on. They play together and look so sweet. They argue and need to be separated. But they never seem to sit still. The older one wants to be treated like the baby. The little one tries so hard to keep up with her sister. Whether things between them are going well or not, their day to day interactions are forever intertwined with their identities as sisters. Somehow during our one on one time things calm down. The constant competition that I hardly even notice, goes away. That sibling rivalry that’s always in the background, like the constant hum from our electronics that goes unnoticed until one day the power goes out and you realize just how much quieter it suddenly became. Lulu seems more relaxed with me on the days her sister is in daycare. More at ease. Subconsciously she realizes that she doesn’t need to compete for my divided attention. And I get to watch her colour or play in the park or just be. She also gets a chance to miss her sister. Lulu is a wonderful big sister. I know the two of them love each other. There are many mornings when Booboo wakes up that Lulu throws a bunch of toys and books into the crib and climbs into it to play with her sister. For her part, Booboo knows who to ask for help doing a puzzle or opening a snack that Mommy said no to. Even at this age they already start forming a united front for causing trouble. But as a big sister myself I know Lulu can get annoyed at having her baby sister following and copying her. This time apart makes her more tolerant. It’s adorable to see the two of them reunited. Lulu is infinitely more patient and loving with her sister after a day apart. This is one benefit of daycare that I did not anticipate. I try to make one on one time with both kids. But this time is more than just about individual attention. 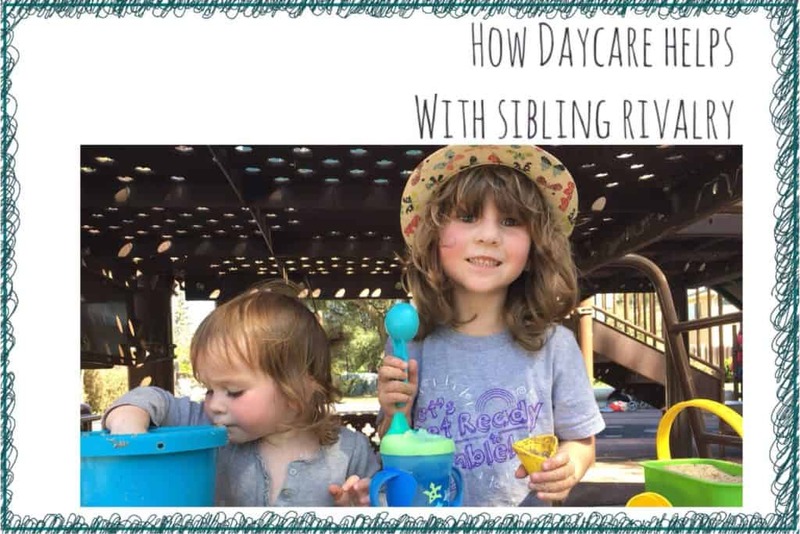 I put my toddler into daycare because I needed a break. Between Lulu’s preschool and Booboo’s daycare, I get 5 hours of kid-free time completely to myself. It isn’t nearly enough time to get much done, but it makes a huge difference for my mental health. At this time last year I was becoming overwhelmed and depressed and resentful. When I seeked help for PPD one of the most effective things for me feeling better was having regular alone time that I could count on and make plans for. Look forward to some self-care. I need this time as much as I need to sleep or eat. If I don’t get enough of it, I become cranky and mean. The time with just Lulu is also a break of sorts. It isn’t a break for my mental health but I feel much more productive on those days. With only one preschooler at home I can get some housework done, going shopping with her is actually quite pleasant and the house only gets half as messy. At 4.5 years old she can play on her own for a while and I can mostly trust her to not fling herself off the table or spill a bowl of sugar all over the floor when I look away for 0.01 seconds. So even though I’m a stay at home mom, having my toddler in daycare gives me these much needed breaks. I definitely feel that I am a better mother and wife when my toddler goes to daycare. What I did not realize before is that maybe Lulu needs these breaks as well. A break from being Big Sister. A break from sharing her toys, her space, her mom. A chance to be relaxed and in her comfort zone with no threat of interference. I see now that just like me, Lulu becomes a better sister when she gets a little bit of sister-free time. This is a lesson I will have to keep in mind as the girls grow and our lives change. Next year Lulu will be in school and I am hoping to go back to work. I don’t know what our schedules will look like or how hectic it will get (I suspect VERY). But I will have to make sure that the kids get not only one on one time with us, but sibling-free time from each other in their own space. I totally get this and would likely opt for this if it weren’t so outrageously expensive. That said, no judgement here! Some mommas can tune out the little things, but unfortunately I’m not one of those moms. I’m super anxious, anyway, and am easily overwhelmed. I credit this largely to my personality but also to the fact that I struggled severely with PPD. Every mom knows her own situation best. If you and kiddos are happy and healthy, then that’s all that matters. That’s so true. We all have to do the best for our families and every family is different. Daycare is really expensive that’s true. We’re lucky that we can afford to do it part time. Thank you for sharing your experience. It’s important for kids to get one on one time. You have a great blog! I really enjoyed reading this! I know sending your child to daycare is super hard! you should read my post about daycare 101. I only have one kiddo but nanny a little boy full time .. I totally relate to sending my little guy to preschool part time and having a little break for the boys ! it makes sense. we all need a break sometimes, even best friends need to be away from each other. Thanks! The time alone is really so important. I completely relate to this. When I was on maternity leave with my daughter (which is one year off where I am), I sent my then 2-year-old son to daycare full time. It gave me the chance to really focus on my newborn, as well as my own mental and physical health. My son loved his home daycare and thrived while he was there. He would come home excited to tell me about his day and see his baby sister. For us, it was the right choice and a great experience.